Some members of Nigerian terrorist sect, Boko Haram are fleeing to Europe, a report has said. According to the UK Daily Mail, the terrorists include children as young as 10 who have been trained as suicide bombers. “They (Boko Haram refugees) will soon start showing up on the Mediterranean’s shores,” the report quoted a source close to Nigeria’s National Intelligence Agency as saying. “Some of these people are trained suicide bombers and fighters, including children as young as 10. 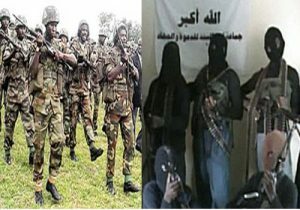 They have all been indoctrinated by Boko Haram and they could soon turn up in Europe’s capitals,” the source added. The report adds that human traffickers from Boko Haram are transporting girls and young men across the Sahara Desert into Libya. Meanwhile, the United Nation’s (UN) International Organisation for Migration (IOM) has warned that trafficking of Nigerian women from Libya to Italy is reaching “crisis” levels. According to the IOM, about 3,600 Nigerian women arrived by boat into Italy in the first half of 2016 and more than 80% of that number will be trafficked into prostitution in Italy and across Europe. The recent activities of Boko Haram have been attracting global attention following the naming of a new leader for the sect by the Islamic State (ISIS). ISIS ejected former leader, Abubakar Shekau and replaced him with Abu Musab Al-Barnawi, a former spokesman of the sect, who has vowed to kill Christians and bomb churches in Nigeria.